Find your STAGE DOOR and open it…..
Well, you may have wondered what the hell happened to me. I have been absent for a while. But, have no fear, I am alive, well and living in America. Swamped by the crush of the holiday season at work and at home I have been running mach 90 with my hair on fire these last few months. And now I sit here in the still of Christmas Eve morn with a cup of coffee and a few world-famous,Franklin Hollenbeck lemon squares that came special delivery all the way from Hell’s Kitchen in New York City. The US Postal Service has served me well. I am in the final throws of script prep for NAME IN LIGHTS….which opens in 11 days. Just a little cabaret to start off 2012. 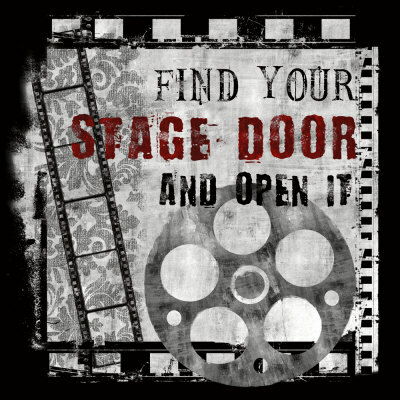 Like the sign says, “Find your STAGE DOOR and open it”. HOW? or is it a WHAT?….cause, are we really looking for a purpose or are we looking for HAPPINESS? Can you find one without the other? When I was 5 or 6 yrs old I saw The Wizard of OZ and Dorothy told me that “IT” was “OVER THERE'”….just a step beyond the rain……Over the Rainbow. And somehow, it has felt that way for almost all my life since. But I have come to realize in 2011 that “IT” was there all the time. And even though I opted to wear comfortable shoes instead of ruby slippers I was just three heal clicks away from understanding that “I” was home. HOME is learning to be comfortable in your own skin and accepting who you are. If you aren’t comfortable with some piece or part of that then it’s time to do some house cleaning . Don’t bother calling in a maid service, you’ll need to tidy up this mess all on your own. Okay – I got work to do. You all have a Happy Holiday.